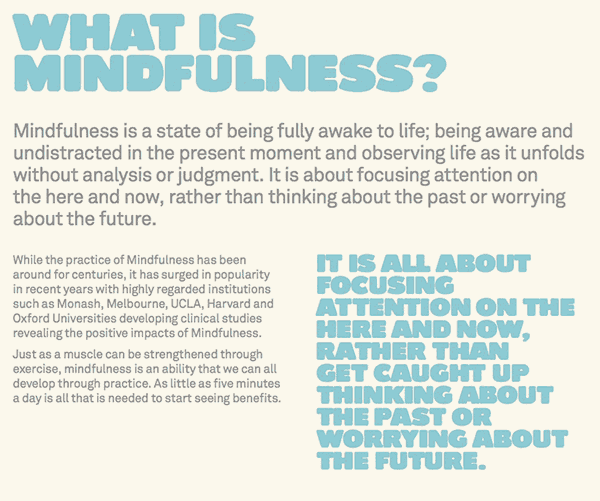 ​This session explores the most basic way of cultivating Mindfulness; bringing awareness and attention to the breath. ​This activity explores how the body is a great object for meditation because it’s always there. It takes participant through a body scan, bringing awareness to each part of the body. A common misconception about meditation is that complete silence is needed to do it. This session guides participants through the mindful process of using sounds as objects for their meditation. Set up: An environment with background noises is perfect for this meditation. ​This meditation asks participants to pay attention to how they feel inside, referring to these feelings as ‘internal weather.’ It explains that like the weather, feelings change, and provides a method by which participants can relax and check-in with their internal weather. ​This re ection asks participants to observe their breath, and then bring attention to different parts of the body through a body scan. ​This session observes how the mind loves to wander, and explains how instead of getting lost in thoughts, they can be used as part a meditation. Participants will be asked to observe their thoughts and watch them pass, rather than getting attached to them. ​This session combines different elements of Mindfulness Meditation: using a glowing bubble to take participants through a body scan, asking them to count their breaths, and then become aware of the sounds around them.